Beer is increasingly being seen as a key menu item; pairing beer with food has caught on with the foodie demographic, and the craft beer market is exploding. With the emergence of a beer sommelier as an upcoming trend to watch out for, beer is brewing is attracting attention that is well overdue. Consumers have been inundated with wine information for decades and now they are thirsting for beer knowledge. Beer accounts for approximately 80 per cent of the entire alcohol volume in Canada, based on a 2008 Brewers Association of Canada (BAC) statistical bulletin. The trend for beer in recent years has been a relatively steady decline in market share (-5 per cent over the last 10 years) while maintaining a slow, steady growth in overall volume (approximately +1.5 per cent). There has been a slight change in consumer consumption patterns as well. The per capita consumption (legal drinking age) of beer has seen some small declines in the past 10 years but has slightly rebounded during the recent economic downturn. In 2007, the per capita consumption of beer rose to 92 litres per person and the following year saw a slight decline to 91.2 litres. These types of numbers show the strength of the category in comparison with 15.1 litres per person for wine and 5.9 litres per person for spirits. Globally, Canada ranks a distant 16th in per capita consumption of beer. The Czech Republic holds the number one spot at 160 litres per person. These statistics should not be surprising; they are simply a result of the aging boomer generation. As people age they drink less beer, and they shift to beer with more flavour and more perceived value. Those who see value in the form of price have created something seldom seen in Canada – the dominance of the discount market. This growing price segment is now estimated to be 30 to 40 per cent of the total beer market. The other two growing beer categories are imports and craft (micro) beers. This should come as no surprise based on Canada’s aging demographic. However, an interesting phenomenon is taking place. The younger generation of beer drinkers (19 to 29 years of age), is now driving the import and craft markets. Their desire for a variety of experiences in their beer drinking occasions is taking them away from the mainstream market. It’s also important to consider that this age group has a much more diverse palate than previous generations, and that they are constantly searching for information to validate their decisions. The 2011 Canadian chef’s survey by the Canadian Restaurant and Foodservices Association revealed that ‘beer sommeliers’ will be an up-and-coming trend to watch. These knowledgeable bartenders, servers and manages are more valued now than ever before. On-premise beer consumers are looking for that enhanced experience and now know that beer is an excellent complement to food. It’s important for professional hospitality workers to understand the nuances of the beer category and to be able to recommend a particular beer with a specific food item based on objective criteria. While a personal recommendation is always welcome, it is important to note that the guest is actually looking to be educated along the way. Professional beer certification is now growing in popularity and can provide your staff with a competitive edge. Check your draught system and make sure it is functional and at optional efficiency with minimal foaming. As well, your keg yields should be high, with wastage below three per cent. Remember, the quality of your beer should reflect the quality of your food. Use branded glassware for all your draught offerings. If you don’t have draught, ask the brewer to support your bottle business with small branded glassware. Studies from the University of California at Berkeley have shown that consumers are willing to pay more for a beer in a properly branded glass. Use the right glass for the right beer. Nothing says that you don’t care like having a beer come to the table in another brewer’s glass. There are lots of folks out there who believe it doesn’t matter – after all, it’s just beer. This is where you can differentiate your operation. The gap is also widening between on-and off-premise consumption of beer. Once again, the aging population has had a massive impact on where beer is being consumed. The aging boomers gravitate to home entertainment and cocooning, and statistics from BAC back that up as 80 per cent of all beer is being purchased at retail. This alarming trend is not good for the hospitality sector. Of course, some of this can be directly related to more awareness of drinking and driving laws, a change in smoking bylaws and an increase in prices. 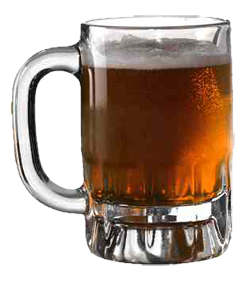 However, the savvy beer consumer also knows that the quality of draught beer is fleeting and they can be assured of consistently good beer at retail. While it’s difficult to hear bad news, this is the one place where proper serving techniques can really make a difference. In a study done by Interbrew in 2000, 82 per cent of respondents claimed to know the difference between a good glass of draught and a poor one. Not surprisingly, bad draught beers were described as flat. Also, about one quarter of all respondents claimed that they would not return to an establishment that served poor quality beer. It didn’t help that at a 2005 global draught beer conference hosted by InBev, it was discovered that at least 30 to 40 per cent of all draught lines were infected with bacteria. Adding insult to injury from the same study is the fact that 22 per cent of beer drinkers believed that foam on beer is a bad thing. Somehow, that small percentage has had a massive impact on the rest of the industry where we are seeing draught beer being poured right to the top of the glass. While this could be attributed to the consumer demand, I also believe it is directly related to poor bartender and server training. Companies like Better Beer are now attempting to bring a certification program to the draught purveyor. Through a draught audit, training and continuous quality checks, bars and restaurants can now tell their guests about the quality of their beer program. Steve Riley, based in Toronto, introduced Better Beer in Ontario a few years ago, and while the program is still in its infancy, he believes it will soon be the standard for beer excellence. You can find out more about this great program at www.BetterBeer.com. Another thing to consider as the rationale for better beer training is the draught variance and spillage rates as reported by Barmetrix, a hospitality consultant firm based in major North American markets. On average, many multi-tap facilities have a 10 per cent variance and a 2 per cent spillage rate. With proper training, Toronto-based Matt Rolfe, operating partner of Barmetrix, believes this can be brought down to an overall combined variance of three per cent. This would result in an annual increase in profit of approximately $50,000 per operator. If for no other reason than this, spend some time training your staff. In mid –March, a state –of- the –art and comprehensive beer education program was made available through online learning. Prud’homme Beer certification (2009) provides extensive beer knowledge to a variety of people including beer enthusiasts, the hospitality industry, beer retailers and brewery and beer distributors. This certification covers a range of topics including the basics of beer and brewing, the history of beer, beer and food and draught beer. The course is available in a classroom setting in the Toronto area at various times throughout the year. However, with the advent of this e-learning module, hospitality staffers can easily complete this six-to eight-hour beer education program at their own pace. Visit www.beercertificate.ca for more information and to register. Also for a sneak peak, visit www.thirstforknowledge.ca.